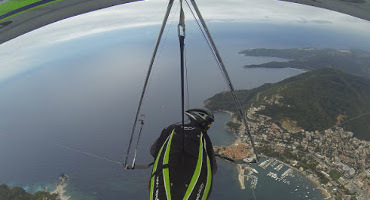 FIVL, the Italian Hang gliding, Paragliding and Kite Association, of which I am honoured to be the President, warmly welcomes you to its home pages. This is place of never ending passion: the flight in the simplest, most pure and easy to practice form. FIVL, established since 1976, as HG community first, joined later by PG and Kite, is strictly involved in writing the history of this sport. Free flying is not merely a sport: it?s a philosophy, it?s an art, it?s a way of life, that needs to be redeemed by mock prejudices mantling their practice and limiting their diffusion as well. Not in a wild search for excitement or an absurd desire for the extreme, but rather in a search for an awareness of flight as a means for a more intimate understanding of the human soul, undertaken with discipline, consciousness and self-control. Our practice is completely in harmony with the environment: free flight is a non polluting, noiseless and nature respecting sport. There are a lot of different ways to practice: somebody could take pleasure just flying downhill in a late afternoon when sun glaze is changing perceptions and sensations. Today safer gliders give the pilot total control, freedom and tranquillity to savour a bird's eye view of the breathtaking landscapes our country has to offer, accompanied by that dreamlike feeling of rising in broad spirals borne by wings lighter than air. This way, the emotions are bigger, and the satisfaction on achieving our objectives more complete. One of the most important condition to fly safely, is keeping the brain ?switched on? : any restriction of age or social condition; we are not, and for sure we will not be, special people. We simply are passionate and proud to be pilots. So, come flying with us: what are you waiting for?